Bake homemade Chanukah dog treats and never go empty handed to a Chanukah party again! Bring a batch of homemade dog treats and the dog will be glad you came! When the biscuits are cool, mix up Magifrost dog treat icing for dogs in blue and white which are the traditional colors for Chanukah. Dip the biscuits in the icing, drizzle it over, or "paint" it on. It will dry hard and smooth and will not crack. It will not melt and will fry glossy and shiny. 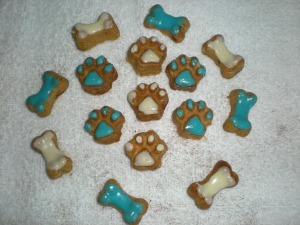 These dog biscuits were made using the mini dog bone silicone mold sold by K9Cakery.com. No need to roll out dough and press cookies which can be time-consuming and needs a lot of effort. When finished, the silicone pan goes into the dishwasher! Make 18 dog biscuits at one time with this pan. as you can see from the picture, the biscuits come out perfectly shaped. Mini dog bone silicone mold makes 18 dog biscuits at once! While the kids are playing the dreidel game at the Chanukah celebration, challenge the adults to win Chanukah gelt. You can safely be the big spender here. Offer $20.00 to the first person who can use a lighter and melt the dog treat icing. Hopefully you have used Magifrost dog treat icing. It will not melt, and you will not lose any money on the deal. Give the contestants a bag of chocolate coins for trying. Let the icing dry completely. Then you will be able to stack the biscuits without worry that there will be indentations in the dog icing. It will dry smooth and people will want to touch it and run their fingers on it. It will dry with a glossy sheen and everyone will want to touch it to see if it is still wet!